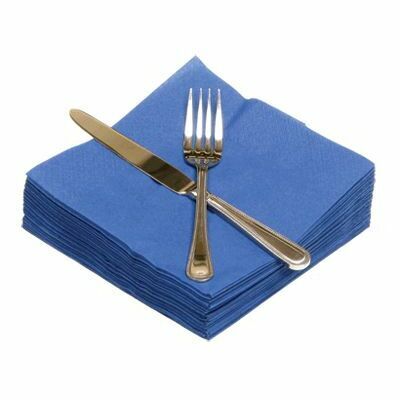 Designed for all manner of events from important dinners through to general mopping up, our Napkins Regatta Blue fit in easily with all environments. Finished with a luxurious feel, each 2ply sheet has been detailed with a distinctive embossed design that adds to its premium feel. Soft and highly absorbent, they are available in an array of colours to suit your needs and personal style. Fold into unique designs or simply place on plates before your guests arrive - these napkins are an essential staple when it comes to hosting dinner parties. This large and economic pack is supplied wrapped in cellophane, allowing it to be stored easily and compactly without the risk of damage to the sheets inside. If you're serving a much larger group, consider popping either our Disposable Table Covers White 90 x 90cm or our Banquet Roll White into your basket today. Alternatively, these napkins come in a range of colours including a traditional White and a Holly Green.